Media and entertainment hub twofour54 won the prestigious ‘Studio of the Year’ award last night for the third year in a row, going from strength to strength as one of the world’s leading film and TV production locations. 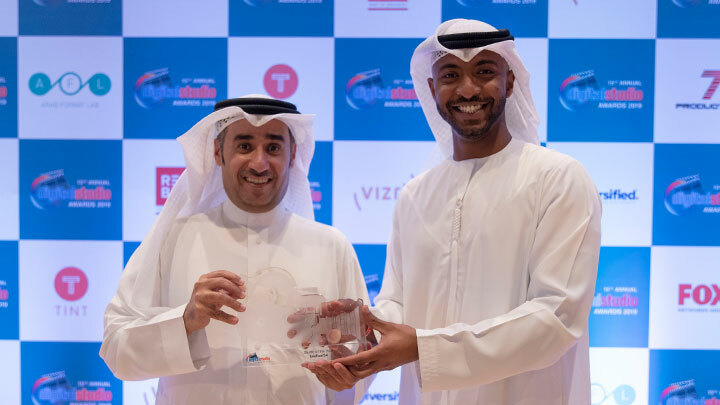 Sameer Al Jaberi and Yusuf Buti accepted the award on behalf of twofour54 at the 15th Digital Studio Awards, which are organised by ITP Media Group and recognise individuals and organisations that contribute to the thriving broadcast and production industry in the Middle East. twofour54 has now won ‘Studio of the Year’ five times, having picked up the accolade last year as well as in 2017, 2014 and 2010. The award comes at the tail end of an action-packed 12 months, filled with an array of international, regional and national productions, including feature films such as ‘Mission: Impossible – Fallout’, ‘6 Underground’, ‘Saaho’, ‘Bharat’ and ‘Race 3’, and TV shows including popular Arabic series: ‘Al Asouf’ season 2, and ‘Boxing Girls’. H.E. Maryam Eid AlMheiri, CEO of Media Zone Authority – Abu Dhabi and twofour54 said: “We are so honoured to have been named Studio of the Year for a third year running. It truly is testament to our world class facilities and talented community. The zone’s award-winning facilities include the 70,000sqm backlot at KIZAD, which features costume, make-up and dressing rooms, along with a canteen and production offices. The Digital Studio Awards recognize individuals, organizations, and companies that have contributed to the broadcast and production industry. twofour54 has previously won Digital Studio’s ‘Post Production House of the Year’ in 2011 and 2012, ‘Studio of the Year’ in 2010, 2014 and 2018 and was named the winner of ‘Best Edit’ in 2015.